1.2 There are monsters in the library! 1.3 Who doesn't like music? There are monsters in the library! No, no, I mean there are plenty of records about monsters in the library. Unfortunately, new monsters have not been added to the game yet due to a bug in our editor. Currently, if we add a new monster, all the identification numbers for the monsters shift over, causing some mayhem with the monster groups. For example, slave mashers currently pop along with outcast goblins instead of with slaves due to the shift in identification numbers. Correcting this bug is on our to-do list of bug fixes, of course, especially since we have at least 50 new monsters that are ready to be added to the game, with ideas for just as many more at the moment. We will add as many new monsters as are needed to fill the extra levels in the dungeon. Due to the lack of new monsters in the game as of now, I feel obliged to at least show off a couple of pictures. 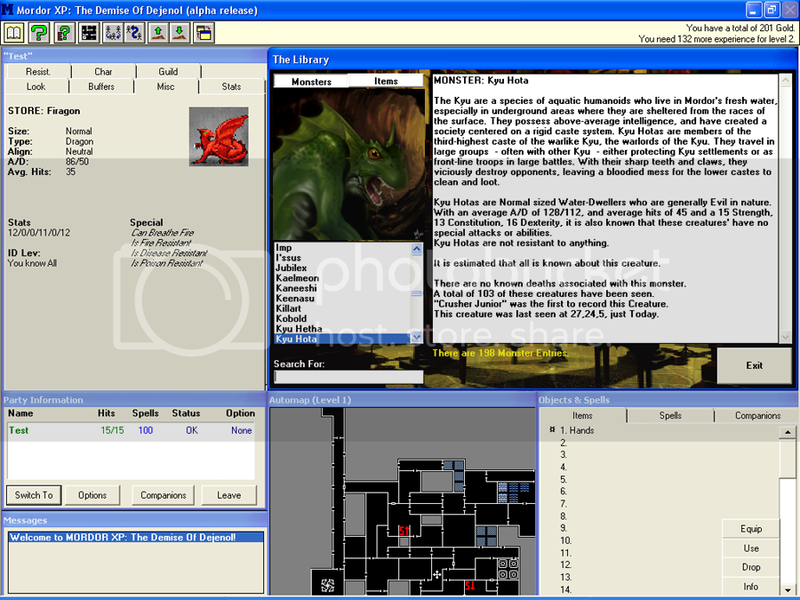 First, take a look at the following screenshot of the library, which includes a picture of the Kyu Hota and the respective description. The descriptions for all the Kyu creatures are tied together, and take a step away from some of the other humorous descriptions we have included. Many of the other descriptions are rather long, so I hope you all have the patience to read them as they are very well written. See if you can spot common references to people - like Dalyn and his apprentice Kazildapek - or events - like the excavation of the Cave of Jewels - in the descriptions. 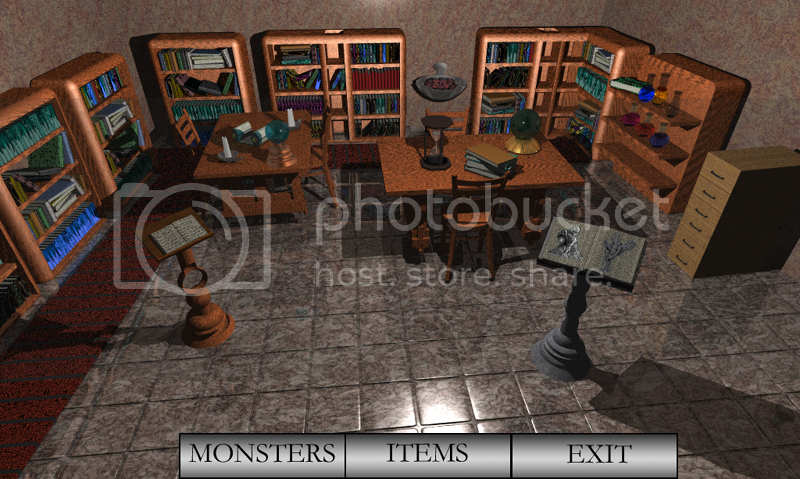 While we're on the topic of the library, the following picture for the library is ready to be added to the game soon. The picture is most likely a final, but is subject to change. Also, the interface for the store has been added; this means that all the buildings in town now have final interfaces set. As usual, we're always looking for talented people to help us out. If you are interested in helping out, send me a PM. We are currently looking for some help in maintaining the dungeon. Graphical artists and talented writers are welcome as well. Look in the new recruitments thread for details.